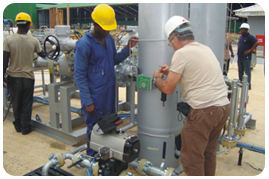 On successful completion of all projects, especially, where new process plants for equipment are installed by Morpol there is usually the need to commission and train the clients’ personnel in order to enable them take effective control and ownership of the facility. Morpol, has a seasoned team of Engineers who are specialized in Plant Commissioning as well as conducting an effective training for clients’ personnel/operators. Personnel trainings which are usually at the instance of our client may be organised on site or within clients’ facilities. However, suitable alternative venues may be selected where Morpol would be able to organise an interactive training session for clients’ personnel.